Look in any farmer's market, grocery store or farm stand, and you will see a bounty of butternut squash. I love this versatile vegetable, which is an easy substitute for sweet potatoes, or yams. You can also add any other seasonal herbs, such as sage or rosemary, if you prefer. This silky soup, with the addition of fresh brioche croutons and crème frâiche, will elevate your soup to elegant, while still maintaining that rustic feel. Place diced pieces of butternut squash into a bowl and drizzle olive oil to coat. Add kosher salt, pepper and thyme. Roast for 40 minutes, or until squash is soft, but not too browned. Add chicken broth, apple cider and then onions and squash to a blender*. Puree until smooth, about 2 minutes. Add more chicken broth or cider if soup is too thick. Season with salt and pepper to taste. 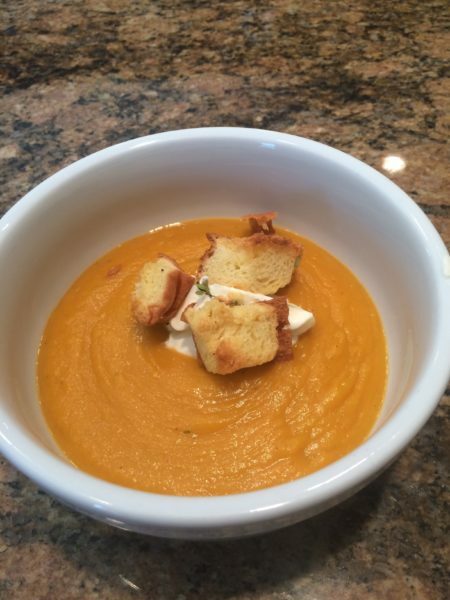 Pour soup into a bowl, top with a dollop of crème frâiche and a few croutons. *My Breville blender is great. It is sturdy and can handle a lot of thick, chunky food and turn it into pure silky yumminess.